good weather for these photos!! That is sooooo pretty. You’re good at this! quite lucky that these are in a place where its easier to photo ~ not using a tripod. they arent open tho SL so i cant try that other nice shot you have got. thank you everyone, you are too kind, i just like having a go at photos like this, i like water and its effects. looks a bit like a bottle in bubbles i thought!!! Yep ! gotta add my "WOW" to that shot also Sticki. Lots to see in this sparkling capture. that raindrop stayed there all day!!! you are so kind, thank you milky and motinot, i just like having a go!! mind you there are loads of them that have not worked!!! Looks to me like an effervescent tablet that's been dipped in water. i know what you mean 7side, except i havent seen one that shape!! rained or drizzly all day here. Sorry Sticki, I was trying to be honest but subtle and was too the latter. Suppository. Thank you DD, my camera makes it nice and easy. 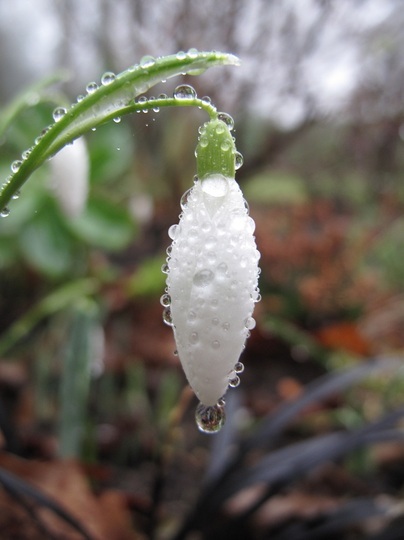 thanks HB, was thinking perhaps i should have called it the champagne snowdrop ~ with all its bubbles?? Don't know how I missed this Sticki...It is a Dazzling shot! Absolutely clear...Perfect. oh thanks pimpernel, you didnt see all the attempts that didnt work though!!! A perfect picture for your Christmas card this year. The word Professional comes to mind, one of the best Snowdrop pictures I have ever seen. blimey bjs thats very kind!! thank you! i still think you are all kind. thanks steve, the drop stayed there for ages so it wasnt so difficult ~ i did have quite a few attempts though! part of the fun is in the trying,you tried,succeded and had a great pic to show for your efforts. quite happy to keep trying at something like this!!! stick with it sticki lol.its hard but worth it in the end.nature is something to be admired wether that be in the garden or in the wild.if you can admire something then you will see the beauty in it.sometimes i will go to a place several times to get the image that i think is best. yes, i know what you mean, its soooo frustrating when you cant get the picture you know is there! the beauty is in the detail i think!!! some of them are still out but they got a bit bashed in the last lot of snow. Would make a lovely painting by the talented people among us ! Thats a good idea val, I wouldn't know how to do that but you are right some on here would! i agree it would make a great canvas. look forward to seeing it!!! It does look 'fizzy' doesn't it. It does HB, I agree! how did you know muddy? i often come back from walks with muddy knees!!! Well that explains why my legs are not bending in the middle anymore . . . kindly return them! . .
Back to the photo . . magazine quality I think. knees are in the post!!!! Whiskers . . schmiskers!!! Trust me to get it wrong . . getting mixed up with nursery-rhymes I think . . lol! i used to like that nursery rhyme ~ you naughty kittens! Hi Sticki the snowdrops have opened today with a bit of warmth after the snow. I've put a picture on of my specials for you.